The effect of ultrasonication on various materials can be tested easily. Hielscher Ultrasonics offers you its ultrasound process facility, fully equipped with ultrasonic devices, process accessories and analytic equipment, for the feasibility testing and process optimization of your application. We offer the service of feasibility test and process optimization to ensure a fast, economic and targeted commercialization of your ultrasonic applications. Our professional and well-trained staff is glad to assist you with your process! If you would like to expose a certain material to ultrasonication and analyze the result, you can either buy an ultrasonic device for your laboratory, or you can use our process lab. 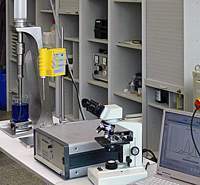 At our plant in Teltow, Germany, we offer you a laboratory equipped with a full range of devices for the testing and optimization of various ultrasonic processes. 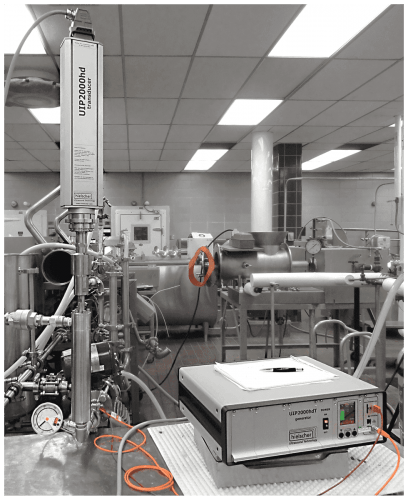 This includes all our ultrasonic laboratory devices and industrial devices, pumps, tanks, controls, and analytic equipment. Of course, our lab is equipped with accurate scales, centrifuge, glassware and solvents as well as goggles and gloves, lab coats. Our long-standing experienced lab manager and our chemist assist in the process trials and in the analysis. In our process lab, we offer devices for the sonication of liquid volumes from 0.1mL to approx, 1000 liters per hour. Equipment for inline refrigeration or heating of the process material is available to control the sonication temperature. The sonication pressure can be increased to approx. 30 bar. Our pumps can handle high viscosity, high solids concentration materials at adjustable flow rates. For the preparation of your test material, we are equipped with all required equipment such as mixers, stirrers, heaters, microwave etc. Analysis and evaluation of the quality and performance of the ultrasonic process is an important part of your visit in our process lab. The post-sonication analysis shows you how the material responses to ultrasonics and reveals what sonication parameters give you the best results. The box below shows you the most important analytical tool, we offer in our process lab. Our service includes a full lab report which includes all ultrasonic process parameters and analytical measurements. Pictures, photos and tables visualize the work performed during the booked lab service in our ultrasonic technical center. The detailed lab report enables you to reproduce all results. Our Experience – Your Advantage! 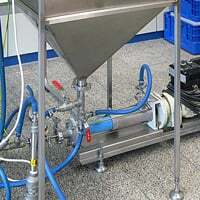 Hielscher is the leading supplier of ultrasonic devices for ultrasonic liquid processing. Our ultrasonic devices are used in a wide range of industries, such as food & beverage, renewable fuels, nanomaterials, ink & inkjet. Hielscher has a broad experience in feasibility testing, optimization and scale-up of processes. We will be glad to assist in your application development. Hielscher’s process lab is not only equipped with the latest ultrasonic equipment, we offer you a wide range of analytical methods to evaluate the results of the sonication processing, too. Laser Diffraction: The Microtrac S3500 employs the patented Tri-laser technology to provide accurate, reliable particle size information. Even in the sub-micron range, measurements are made without typical sample-to-sample variation evident in many other systems. By increasing the number of light sources, the unique Tri-laser technology makes more effective use of photo-detection devices, while maintaining maximum stability and alignment of the optical system. Microtrac S3500 complies with or exceeds ISO 13320-1 Particle Size Analysis- Laser Diffraction Methods. Dynamic Light Scattering: The Nano-flex characterizes colloidal systems by dynamic light scattering within a size range of 0.3 nm to 10 µm and is suitable for material systems with concentrations from ppm up to 40% vol., depending on substance type. Minimum volume for measurements is 1 droplet. The Nano-flex is suitable for particle size characterization from 0.3 nm to 6.5 µm. For determination of dynamic and kinematic viscosities, flow curves, yield point etc.